At our third Doo Wop outing, we started to push the limits of the car. Through the traditional three runnings of the Taholah stage, we pushed hard. If it weren't for a couple taps of some chicane barriers, we would have placed second overall and beaten all the Open class cars for the day. 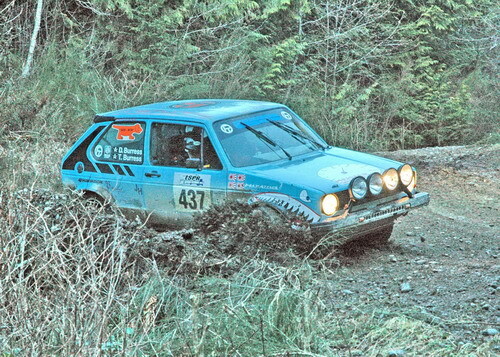 The Northwest powerhouse, Dave Hintz (with new co-driver John Ford) had some mechanical problems and DNS'ed the second stage, leaving us to fight with Woodward/Grahn and Mager/Dumaoal for the podium places behind VanBogart/Barber whose second stage time was fast enough to put them 30 seconds up. Without those pesky barriers, we'd have beaten Woodward/Grahn in the FrankenProtege by 2 seconds. So close! Day 2 started with us winning the first and second stage OVERALL. Stage 3, Pico, went well and we finished third overall. However, as we exited the stage, we found some fuel pump issues that we tried to fix in service. Various problems with the new fuel pump and our back up to the back up caused us to exceed maximum permitted lateness and we were out of the rally. With nothing to lose, we were allowed to run the last four stages as a fun run. Apparently a fun run for us means setting the fastest Gp2 stage time on the famous Brooklyn Tavern stage and getting our name on "the list", smashing the 8 year old record by 9 seconds and tying the PGT record. Now that the future of the Doo Wop Rally is in question, this record may stand for a long time.